Roland Wakelin will forever be recognised as one of the pioneers of modernist art in Australia. With colleague Roy de Maistre, their Colour in Art exhibition of 1919 was ground-breaking and featured Australia’s first ever abstracts amongst high-coloured scenes of the streets and buildings around Sydney’s lower north shore. Whereas de Maistre moved permanently to Europe in 1930, Wakelin, a dedicated family man, stayed put and his imagery became increasingly personal. Edward Street, North Sydney, 1927 is a view from the house the family occupied at 50 Edward Street from 1927, until they moved next door two years later; and the view from its upper windows is still essentially the same. Following the 1919 exhibition, Wakelin and de Maistre studied with the Melbourne tonalist Max Meldrum before the young New Zealander1 travelled to London in 1922, visiting galleries and viewing first-hand the details of original artworks he had otherwise known only through reproduction. He had previously absorbed the theories of artist Paul Cézanne but seeing actual paintings by the Frenchman reinforced Wakelin’s understanding of Cézanne’s maxim: ‘Penetrate what is before you and persevere in expressing yourself as logically as possible.’2 Whilst other artists such as de Maistre pursued the Cubist aesthetic (which Cézanne also influenced), Wakelin chose ‘a less radical path (which) reaffirmed an early 20th-century idealism founded on formal principles of art. His beliefs were a kind of painterly truth, art as a reflection of natural order.’3 The resultant paintings are clear expressions of these ideas, less showy but imbued with quiet dignity and fidelity. One of Wakelin’s closest friends was the gallerist John Young who was also in London whilst the artist was there, and the two socialised regularly. On his return, Young went into partnership with Basil Burdett to open the renowned Macquarie Galleries in 1925, choosing Wakelin for their inaugural exhibition. 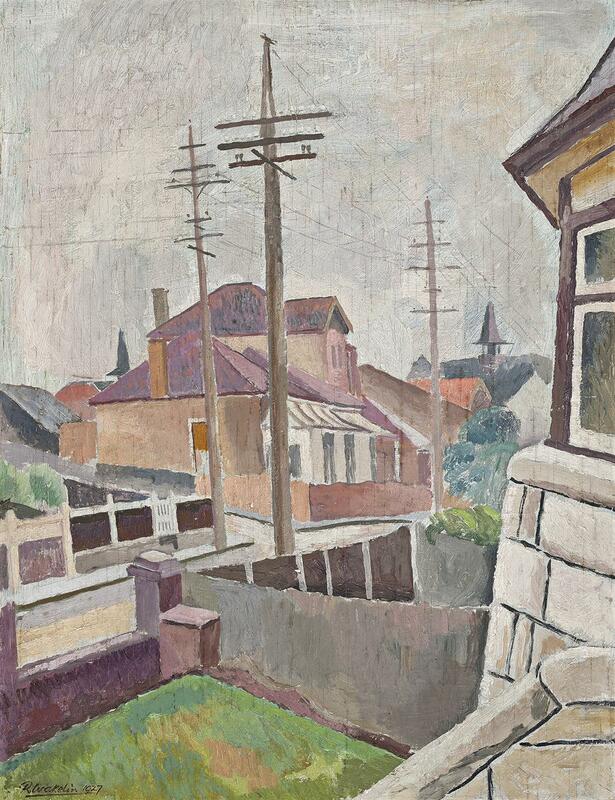 In 1928, Wakelin held his second exhibition there and Edward Street, North Sydney was included, probably purchased by Aeneas McDonnell who had recently joined Young in running the gallery following the departure of Burdett. Over time, McDonnell amassed an important collection of Australian art, and became one of the renowned ‘Monuments Men’ who helped track looted Nazi artworks. From 1947, he also served as an advisor to the National Gallery of Victoria, Melbourne for the Felton Bequest until his death in 1964. The Wakelin family home at 50 Edward Street still stands, a two storey double-fronted house whose upper windows survey the street below. The houses opposite are also extant and their distinguishing fences feature in a related painting from the period, Cat in the Window, sold through Deutscher and Hackett in 2010.4 Critically, Cat in the Window shows the distinctive arched window which remains at number 55, thus confirming the location for the painting on offer here. In a letter to John Young, Wakelin explained his painterly approach as being securely based on definitive preliminary drawing. He would then “‘colour-in’ the outline in a most deliberate and summary fashion striving always to rely on the feeling and fighting shy of the enemies: accuracy, finish, superficial resemblance, scientific formulae… the bugbears and the damnation of painters.”5 Wakelin’s use of the recently invented plywood as a base was also a clear statement of intent, one which firmly proclaimed his continuing connection to the modern world. 1. Wakelin arrived in Australia in 1912.